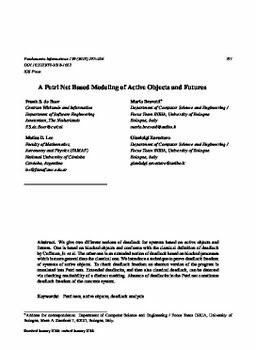 We give two different notions of deadlock for systems based on active objects and futures. One is based on blocked objects and conforms with the classical definition of deadlock by Coffman, Jr. et al. The other one is an extended notion of deadlock based on blocked processes which is more general than the classical one. We introduce a technique to prove deadlock freedom of systems of active objects. To check deadlock freedom an abstract version of the program is translated into Petri nets. Extended deadlocks, and then also classical deadlock, can be detected via checking reachability of a distinct marking. Absence of deadlocks in the Petri net constitutes deadlock freedom of the concrete system.